We suggest LAN wiring layouts to match your office environment, network environment, and budget. From small to large, we support the construction of your network. LAN installation for a new office or for an office move (to another location). LAN removal from an old office to LAN wiring and installation for a new office. We handle installations from small-scale LANs to large-scale building-wide LANs. Cluttered wiring can cause problems, such as line breaks. For peace of mind leave your often neglected LAN wiring to the pros! Along with office layout modifications, we also handle LAN wiring and installation as well as PC disconnection, connection, and shipping. 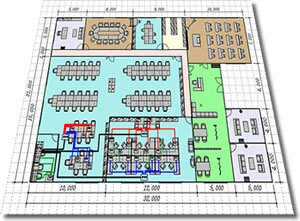 We also handle expansion of LAN wiring to match an increase in the number of employees, starting even from one employee. At the same time, we also handle telephone and electrical wiring and outlet expansion. We also mount and earthquake-proof your server, router, and UPS in 19-inch racks. Are the cables connected to your existing server organized? Or are they cluttered when viewed from the back? Adding destination tags to cables and organizing your wiring makes maintenance smoother. In addition to installations in offices, we also do LAN wiring and optical cable installations for schools and factories. We also install projectors (ceiling mount) and speakers in offices (conference rooms). Power and telephone installations can be done at the same time as new LAN installations or when moving an existing LAN to a new location.